The Marketplace Fairness Act, if signed into law, will empower state governments to require out-of-state online retailers and mail order companies to collect sales tax, or more specifically use tax, on interstate sales. To date, online retailers have been required to collect sales tax only if the business has a presence (e.g. warehouse or store) in the same state in which the consumer resides. Currently, if an online retailer sells a product to a consumer living in a different state, the consumer is expected to pay the tax. Many consumers usually do not pay use tax on their Internet purchases because they are unaware of the requirement or they know it is difficult for states to enforce. Brick-and-mortar retailers say this gives online retailers a price advantage over local sellers. Online retailers say the fact that there are more than 7,500 tax jurisdictions in the U.S. places an unreasonable burden on Internet-based businesses. Hence, lawmakers in Washington, D.C., have been debating for years about how to allow states to require online retailers to collect sales and use taxes. Give states the option to collect the sales taxes they are owed under current law from out-of-state businesses, rather than rely on consumers to pay those taxes to the states—the method of tax collection to which they are now restricted. Streamline the country’s more than 7,500 diverse sales tax jurisdictions and provide two options by which states could begin collecting sales taxes from online and catalog purchases. Exempt sellers who make less than $500,000 in total remote sales in the year preceding the sale to qualify for an exemption and not be required to collect the tax. (Source: press release, U.S. Senator Michael Enzi (R-Wyo.). Regarding the second item, streamlining the collection process, the bill offers states two methods of simplification. They can join the Streamlined Sales and Use Tax Agreement or they can adopt a set of simplification guidelines listed in the bill. Those options are discussed in more detail later in this post. Why is Congress involved in a State Sales Tax Issue? If a business does not have a physical presence (substantial nexus) in a state (e.g. warehouse, store, employees) it should not be required to collect taxes for that state. The administrative and record keeping complexities involved with variations in tax rates and allowable exemptions across many states would place an undue burden on interstate commerce. The Supreme Court justices said that, under the Constitution, Congress has the ultimate power to resolve this issue. Amazon.com, the world’s largest online retailer, endorsed the Marketplace Fairness Act in a press release stating: “Amazon strongly supports enactment of the Enzi-Durbin-Alexander bill and will work with Congress, retailers, and the states to get this bi-partisan legislation passed,” said Paul Misener, Amazon vice president, global public policy. “It’s a win-win resolution – and as analysts have noted, Amazon offers customers the best prices with or without sales tax.” This may have been a surprise to many because for years Amazon has opposed this type of legislation. According to Publishers Weekly, “while Amazon staunchly opposed state-by-state tax initiatives, it would back a national policy.” While the Marketplace Fairness Act is not a national requirement, it is a solution focused on standards and simplification. But that apparently is not the only motivation for the Amazon turnaround. In an article published in the Los Angeles Times, Marc Lifsher writes “the company is now looking to profit – by hiring itself out as an Internet tax collector.” (See Amazon offers to serve as tax collector – for a price.) On the other side of the debate, eBay, the largest online auction and shopping site, opposes the Marketplace Fairness Act. In a press release of their own they said: “This is another Internet sales tax bill that fails to protect small business retailers using the Internet and will unbalance the playing field between giant retailers and small business competitors. It does not make sense to expand Internet sales tax burdens on small businesses at a time when we want entrepreneurs to create jobs and economic activity.” The bill has wide support from brick-and-mortar retailers such as Home Depot, Wal-Mart, and Target. They believe online retailers (with minimal or no infrastructure in most tax jurisdictions) have an unfair advantage by not having to charge sales tax. How will Online Retailers Collect and Remit Taxes with over 7,500 Jurisdictions in U.S.? That opinion was rendered in 1967, two years before ARPANET was created – the precursor of the Internet. Today, more than four decades later, in a world in which small startups can compete with multinational companies due to the wonders of the World Wide Web, the logistics concern is still valid. Without standardized, scalable, quality software for collecting and remitting tax funds across many jurisdictions, along with developers committed to ongoing software maintenance and support, the Supreme Court opinion of 1967 will still apply. Time will tell. (7) Provide remote sellers and providers with 30 days notice of a rate change. Local rate changes may only be effective on the first day of a calendar quarter. A remote seller or provider will be held harmless for collecting tax at the immediately preceding effective rate during the 30-day period. Each state must provide updated rate information as part of the software and services required under the previous paragraph. Regarding item 4 in the above list, six certified service providers are listed on the Streamlined Sales Tax (SST) website. According to the SST FAQs page, at the time of this post, twenty-four states so far have passed the necessary conforming legislation to be eligible to require out-of-state retailers to collect sales tax. Nine states have introduced the conforming legislation. 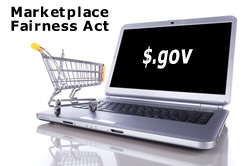 It seems reasonable to assume that more states will get on board if the Marketplace Fairness Act is enacted. If that happens, it looks like there will be some real benefits for businesses to use the Streamlined Sales Tax Registration System. See the registration section of the SST website for more information. But remember, the Marketplace Fairness Act excludes businesses that generate $500,000 or less in out-of-state sales in the U.S. in the preceding calendar year. U.S. Senator Lamar Alexander (R-Tenn.), a co-sponsor of the Marketplace Fairness Act says the bill would “close an online sales tax loophole.” He presents his case in this YouTube video. What do you think? Should online retailers generating more than $500,000 in out-of-state sales be required to collect sales tax? Feel free to leave a comment below.